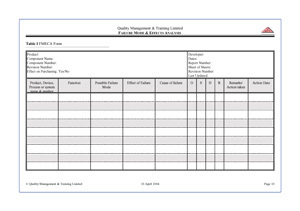 Failure Mode Effects Analysis (FMEA) or to give it its correct title Failure Mode Effects & Criticality Analysis (FMECA) is a logical technique used to identify and eliminate possible causes of failure. The technique requires a sequential, disciplined approach, to assess systems, products or processes in order to establish the modes of failure and the effects of failure on the system, product or process. This is to ensure that all possible failure modes have been fully identified and ranked in order of their importance. The FMECA discipline requires the documentation (see worksheet opposite) of any evaluation with regard to the failure mode, effect and criticality. The analysis work can be applied at any stage; design, manufacture, test, installation or use, but is best performed at the early (development or design) stage. In a simple system the study may be performed on the total system or product but with more complex systems it may be necessary to break the product down into various sub-systems or sub-assemblies. The technique is often seen as part of an organisation's; Lean, Value Stream Analysis, Root Cause Analysis programme. If the product fails the trial then the modified and hopefully improved design will need to be retested - this can lead to inefficient use of resource. Tests and trials can usually only be performed on a limited number of products, consequently all the possible variations in specification and build standard cannot always be evaluated. Using small samples may also not be sufficiently accurate to predict field failure rates, particularly when attempting to identify causes of potentially low field failure rates (½ or 1%). These missed potential failures may result in the need for product recall or the issuing of advisory notices, (particularly in the case of safety critical failures). This can be not only expensive but also damaging for both the company and product's credibility and reputation. Initial check for identification, damage & paperwork. Segregate & locate items from untested and test. Confirm product tested and within spec.